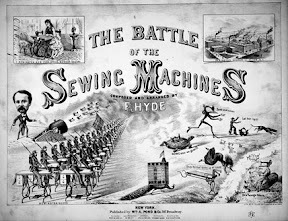 "The Battle of the Sewing Machines" was composed and arranged by F. Hyde for the piano, and was published in 1874 by Wm. A. Pond & Co. of 547 Broadway, N.Y., N.Y. The lithograph by R. Teller of 120 Wooster St., N.Y., N.Y., illustrates a "battle" of sewing machines. The Remington "army" is marching towards the fleeing Singer, Howe, Succor, Weed, and Willcox & Gibbs sewing machines. The soldiers are riding the Remington treadle machines like horses and are carrying Remington rifles. The Remington No. 2 sewing machine had just come out to market in June 1874. The family treadle machine with a drop-leaf table and two drawers would have cost $75.00. On the top left of the sheet music, a woman is pictured sewing on a Remington machine in the Remington office at Madison Square, New York. In the right box is featured the Remington Works of Ilion, N.Y. The music consists of 11 pages, with such subtitles as: "Howe the battle began"; "Advent of all the best machines"; "Song of the Sewing Machine Man: 'How Can I Leave Thee'"; "Triumph of the Remington Sewing Machine," and "Home Sweet Home." I got a real kick out of finding this and imagining this 'battle'. In my sewing room, there is a battle going on between myself and my aging but well loved Viking whose foot pedal sews on her own, and fails to sew when my foot asks her to. Then, there is my relatively new Babylock serger who has to 'take up the slack' and do all of the sewing that my Viking is being so obstinate about doing! Nevertheless, the manic Christmas sewing is in full swing....just wish I had "Howe the Battle Begun", Song of the Sewing Machine Man: 'How Can I Leave Thee'"; "Triumph of the Remington Sewing Machine etc. Now that would be battle hymns to truly sew by! I was telling a friend about your sewing machine woes, and she said she had the same thing happen with her machine - it turns our to be the foot control! Maybe there's one around you can borrow to check it out? That's hilarious. It would certainly be interesting to hear these sons. Somehow I don't think Remington won that battle.